After reading Serious Eats’ review of Papatzul‘s “under appreciated” food, I decided to return back to check out the place. As I’ve mentioned, I’m always trying to find my go to Mexican spot in the city. Something with good prices, reasonable quality, and a fairly traditional menu. I was curious if this might finally be it. 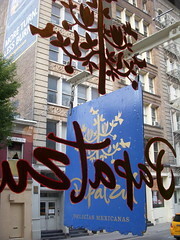 I had read their happy hour prices were only honored in the bar area, which is the front room of the restaurant, and I was happily able to grab a couple of tables right in the main front window. Sometimes I find service in such bars to not be the best, but was pleasantly surprised with the attentiveness of our server – who was also the main bartender. We started with an order of their guacamole. I have to say, I was quite impressed and at $9, I found their rendition far superior to Rosa Mexicano’s – and without its $14 price tag. Perhaps it was not theatrically prepared tableside for us but we had no doubts that it had been freshly made only minutes prior to appearing on our table. I opted for the tostadas de jaiba con chile habanero, which were crab tostadas with avocado and habanero lime aioli. At $12, the portion size was quite generous and the kick of the habanero was balanced out nicely by the avocado. My sister was going to order their sea bass, which the menu described as coming served with shaved peppers and jicama, a chile mulato/tamarind sauce, and cilantro mashed potatoes. 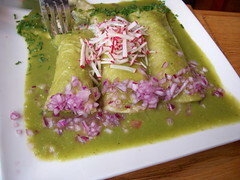 Unfortunately though they were out of sea bass, so she opted for the enchiladas san marquenas, which were braised beef enchiladas with poblano tomatillo sauce. She said the beef was quite good. The dish was $18 and included three enchiladas. Don’t miss the happy hour specials. The margaritas, made with white tequila, pack a lot of punch into a small package. Margaritas are $6 and sangria $5 from 5 until 8:30pm daily. Overall, I was quite impressed with Papatzul. I must say though, I’m still in search of that more standard restaurant. The menu’s creativity meant those good Mex staples didn’t necessarily make the cut. But for creative Mexican, Papazul does have it right. I haven’t heard of that one. Thanks for the suggestion. Definitely will do!